This week the weather has been pretty wild here in the USA, with dozens of people killed by tornados in the Oklahoma area. 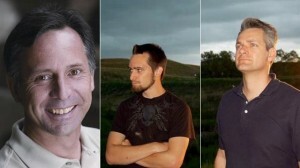 One of those killed is world renowned scientist Tim Samaras. He was killed alongside his son Paul and research assistant Carl Young as they were doing their rather dangerous job. Samaras was a Severe Storms researcher, much of his funding coming from the National Geographic magazine. He might have just seemed like a storm geek to some, but his pioneering work has helped us to predict and understand these types of storms a lot better. He and his team worked for decades on how to predict where and when tornados would form, so that they could race to the spot and leave their battery of measuring and photography equipment inside the storm. They developed a probe that took measurements within the tornado itself, helping forecasters to determine where storms may form and to give warnings to people living in its path. The new generation of this probe measures pressure drops within tornadoes, the very cause of the high winds that characterize these storms, alongside other data that can be used to determine the destructive capability of the storm. The team has also pioneered storm photography, devising a high speed series of cameras that can take pictures from different angles inside the storm. His photography work around lightening has helped to push scientific understanding of the phenomena. These were not some reckless guys driving around looking for danger as some might think, Samaras was a scientist, a meteorologist, an adventurer and an engineer. His team were experts in their field, highly educated and determined, and they will be sadly missed within their community. Their approach seems to hark back to a day of science pioneers, Marie Curie dying of radiation sickness through her work on radiation therapy, or Jean-Francois De Rozier, the first ever air crash death as his balloon crashed to the ground in 1783. The fruits of their research live on today though, as will those of Samaras and his team. For more information about their work look up their TWISTEX Facebook page. Thank you for informing everyone about their work Jonny, many people (ashamedly) including myself, upon hearing the story would stereotype and believe a group of mad storm-chasers had been killed. I have no doubt their research shall live on as a testament to them. What a great bunch of guys.